The energy and vibrancy of the bustling city of Hong Kong is hard to describe. If you’d like to get engaged in the Pearl of the Orient you’ll be spoiled for choice. Here are some great ideas for proposal locations to help you plan your trip. If you ask locals about the most romantic spot to propose in Hong Kong, the majority will answer The Peak. 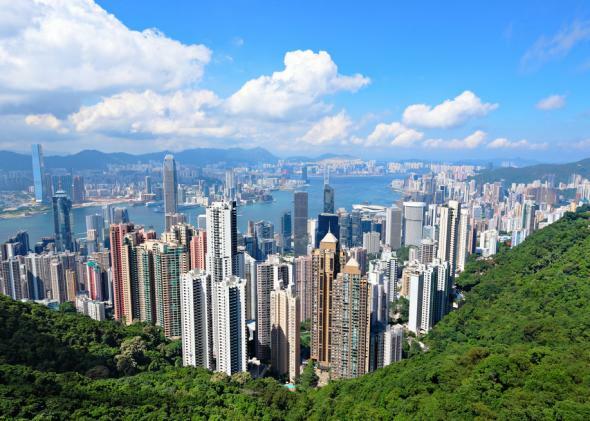 The Peak, which is also known as Mount Austin or Victoria Peak, is the highest mountain on Hong Kong Island and stands 1811 feet (552 meters) above sea level. The best way to access the peak is to take the 45 minute tram ride, which in itself offers an amazing view of the city and a possible romantic proposal spot. For nature lovers The Peak offers a number of walking trails for taking in lush tropical forests and unique wildlife. One of the more romantic walks takes in Victoria Park Gardens, which has a Victorian style pavilion to add to the romance and a stunning view. While the top of the mountain is closed to the public, this is the highest point you can walk to. For those that prefer man made magnificence, The Peak Tower is a wonder of modern architecture and has become a true Hong Kong icon. It houses an impressive array of top class shops, restaurants, and entertainment venues. A great proposal location would be the Sky Terrace, a 360 degree viewing platform that offers superb views of the city and the islands. Tsim Sha Tsui, often referred to locally as TST, is the bustling heart of Hong Kong. It's located at the tip if the Kowloon Peninsula. The most exciting way to access Tsim Sha Tsui from Hong Kong Island is via the legendary Star Ferry, which in itself is a fabulously romantic place to propose as it provides a stunning view of the Hong Kong skyline as it crosses Victoria Harbour. In Tsim Sha Tsui itself the waterfront promenade can be a wonderful location for a proposal. At around 8 PM every night there is a spectacular light and sound show known as The Symphony of Lights which celebrates the energy, spirit and diversity of Hong Kong. Propose on the promenade just before the show begins and it will only add to the magic of the moment. While the Nathan Road, a busy shopping street at the heart of the Tsim Sha Tsui might not seem like a particularly romantic place for a proposal, it is one of the best known and most enduring images of Hong Kong, and would certainly make the occasion memorable. Lantau Island is Hong Kong’s largest island and is located at the mouth of the Pearl River. It is ideal if you’re looking for a less hectic spot for your Hong Kong proposal. The best known attraction of Lantau Island is the Giant Buddha, which sits at the top of the Ngong Ping plateau with the right hand raised to deliver a blessing to all. Close by is the Po Lin Monastery and the spectacular mountain views, as well as the serenity of the location, make this area and ideal place for a proposal. The ascent to the Giant Buddha can best be achieved via the Ngong Ping 360 cable car ride, which again can be a great place to pop the question if you have a cable car to yourselves. You can even ride in a crystal cabin, which has a glass bottom for a unique bird’s eye view. Take a walk around the Ngong Ping Village where you will be entertained by street performances and can make a wish for your future at the Bodhi Wishing Shrine.